(Newser) – Introducing EBLM J0555-57Ab, which now has the distinction of being the smallest star ever discovered. In fact, scientists at the University of Cambridge say stars cannot possibly get much smaller and still function as stars, per a release at Phys.org. This one is 600 light-years away from Earth and 2,000 to 3,000 times dimmer than our own star, aka the sun. In terms of size, it's more like a planet than a star—by way of comparison, it's slightly bigger than Saturn but smaller than Jupiter. 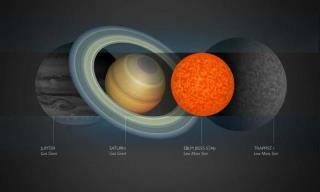 Scientists spotted it while hunting for exoplanets and figured, based on its size, that it was an exoplanet itself. Their thinking changed, however, when they looked beyond the object's radius and focused on its mass. these"brown dwarfs" are able to, theoretically, burn for trillions of years but no one knows for certain because the universe is only 14 billion years old and their Goldilocks zone is very close to the star. Its a poor choice of words in the head line as WIMP means something in science ...its a Weakly Interacting Massive Particle. Eighty-five times the mass of Jupiter and still considered small!!??!! WOW!